Poet Wallace Stevens wrote a wonderful poem called Thirteen Ways of Looking at a Blackbird . Today I'm adding a few more. This time last summer I was hiking the hills and canyons around Reno, Nevada, where we were living. Quite a contrast from coastal North Carolina, my current digs! No matter where I find myself, though, birds always attract me as photographic subjects. I'm neither a professional photographer nor a serious birder, but I enjoy "shooting" birds and learning what I can about them in fits and starts. Many years ago, when I was in graduate school in Bloomington, Indiana, I escaped whenever possible to Yellowwood Lake and particularly to a quiet little inlet full of waterlilies and cattails that rang with the trill of red-winged blackbirds. Years later, I had a bird feeder outside the window of my writing/painting space, and a male red-wing came regularly to dine. He always announced himself with a rolling trill as he landed, and that never failed to make me smile. 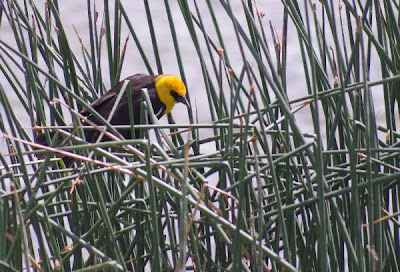 Here's a handsome fellow in the wetlands of Hidden Valley. 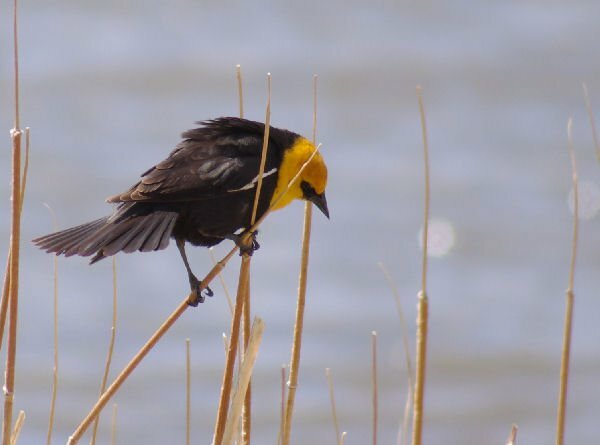 The yellow-headed blackbird lacks the melodic song of his red-winged cousin, but makes up for his scratchy voice with his gloriously flashy headgear. The first time I saw a flock of these gorgeous guys was in a field in Indiana, where they are considered "accidental" birds traveling out of their normal range. In Nevada, as in much of the West, they are pretty common in wetlands, and the males are hard to miss. 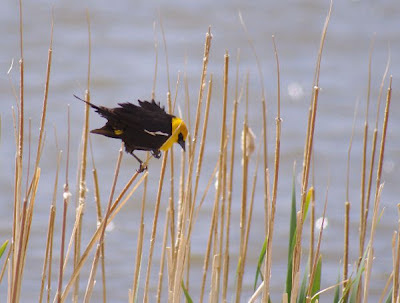 I was hiking one windy spring day and stopped for a while to watch the birds battling the wind. Here is one of them, clinging to a wildly swaying bit of grass. Although not a blackbird, the beauiful Western meadowlark is a close relative, as these three birds are all members of the Order Passeriformes and the Family Icteridae. I loved to take evening walks in Hidden Valley along a particular two-mile stretch with ridges and canyons to the east and a long sage-strewn stretch of land to the west. The glorious shifting colors over the Sierras as the sun's rays grew longer were inspiring to be sure. But if you've ever heard larks sing, you know why so many poets have praised their music, and among larks this yellow and brown singer is, to my mind, one of the best. So here's so beautiful birds and beautiful birdsong, and to long walks in their presence. Such beautiful pictures to go along with your poetic remembrances. 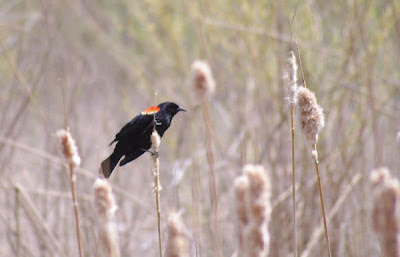 When I was a child growing up in rural WI, the first bird that I learned to recognize was the male red-winged blackbird. I didn't learn to spot its much plainer female until I was an adult. 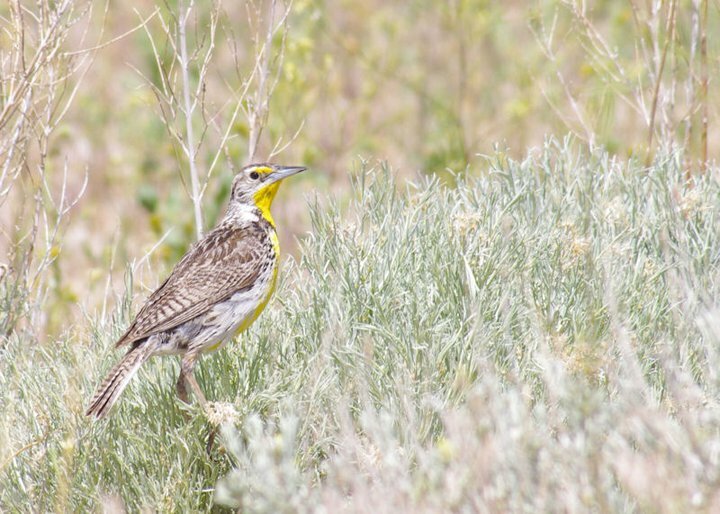 You just have to love meadowlarks -- they are so very cool. They are pretty, with that little splash of yellow, and the song is just what you want from a song bird. Right, the females blend in with the many other black(ish) females of various species. The Eastern Meadowlark's song is similar but not identical to the Western's - used to hear them in the Midwest all the time. From sullen earth, sings hymns at heaven's gate;"
Great photos! Alas, I haven't seen a meadowlark in many years. Kathleen, is that because you aren't where they are, or are they missing from old haunts? Your photos are great. The birds are so colorful--here in the upstate of SC, we don't see most of those. I did see a red-winged blackbird near Charleston once. It was a thrill. Nice post. I enjoyed the pictures and the descriptions. Thanks, Ellis. 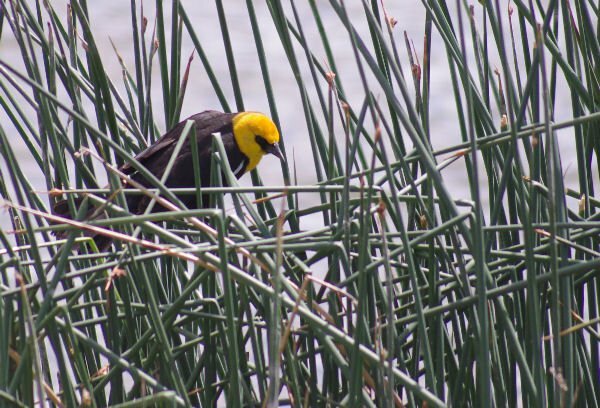 The yellow-headed blackbird is a Western bird, and they are gorgeous. But the Carolinas have some great birds, too!